CMC’s versatile services are designed to meet and exceed your recovery needs. We help you save time and money. Every day CMC assists a wide variety of businesses by streamlining receivables and reducing operating expenses. First, we provide a complete range of powerful collection tools. Second, our innovative services will save time, increase cash-flow and reduce future collection placements. 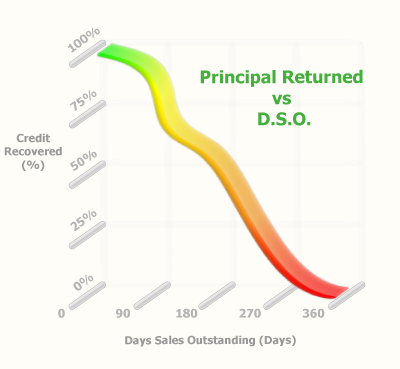 This graph shows how unpaid debts can quickly turn into delinquent accounts. At 12 months past due, there is little chance your principal will be returned without the help of trained professionals. Our Account Managers have the ability to review, assess and make recommendations on your delinquent accounts to yield the most favourable outcome for your company.